Launched in 1852, the steamship Black Warrior was christened after the legendary Indian chief Tuscaloosa whose name comprised two Choctaw words—tusca (warrior) and lusa (black). Two years later, during one of its routine trips between New Orleans, Havana and New York, the 225-foot ship was seized by Cuban customs officials claiming that its load of Alabama cotton should have been declared, even though it was not to be unloaded on the island. 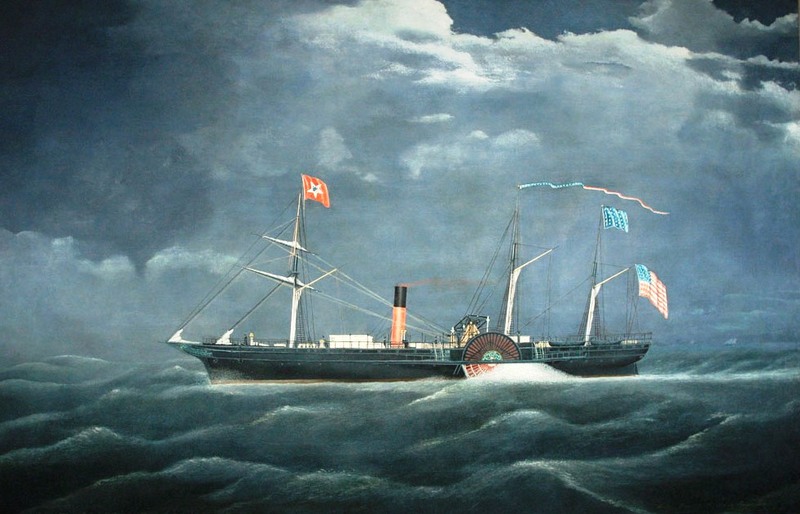 The incident caused a furor, effectively derailing President Franklin Pierce’s plan to buy Cuba. Instead, pro-slavery forces demanded war with Spain, seeing this as an opportunity to turn Cuba into a slave territory. As the United States grew increasingly bellicose, Spain backed down and paid compensation for having detained the vessel whose fate would presage the Civil War. 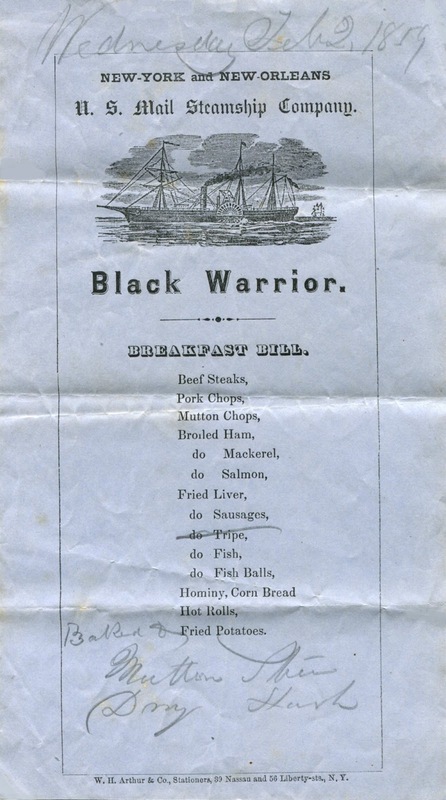 Black Warrior also carried passengers, as indicated by the breakfast menu below dated February 2, 1859, two years before seven slave states with cotton-based economies formed the Confederacy. Set menus such as this one were printed in advance, following the practice of transatlantic ships. Without the inscribed date and other emanations, this menu would provide only a general idea about what was served that day. 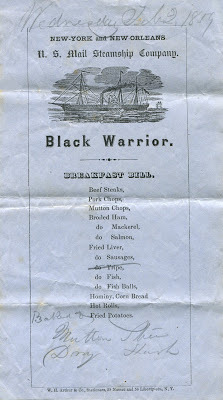 Eighteen days after this menu appeared, the Black Warrior ran aground on Rockaway Bar, while trying to enter New York harbor in a heavy fog. Although the passengers and cargo were safely brought ashore by other ships, the wooden side-wheeler settled deeper into the sand and was soon pounded to pieces by a gale. A doomed ship to be sure... guess it's not a good idea to put black in a name for a ship! Oh darn, I wanted tripe. Annotated menus are great. It's certainly similar to transatlantic menus I have viewed, but it is interesting that eggs are not a part of it! A mystery to me is why on breakfast menus I have looked at for transatlantic ships up through the 1850s (roughly 6-8), eggs are always on the printed menu (omelet, boiled), but passengers or stewards almost always have them crossed out. It would make sense on a sailing ship, but these are steamships I am talking about. I have read a lot about egg preservation for voyages in seamen's cookbooks, but it seems that for a two-week voyage, not even preservation would be necessary if the eggs could be stored away from heat. Perhaps that's the thing: on those early steamships, escaping the heat was difficult. Still puzzling this one through. It might be that demand for eggs was so high among passengers that the cook quickly ran out. At any rate, this steamship put the problem aside by not offering them on the printed menu! Thanks for these wonderful insights and menus of yours.